We’re going to try a couple amazing plugins which many of you probably already know, they are the Sonnox Oxford Envolution and Oxford Reverb. Many of you have pointed out that these plugins have been out for a while now and the Oxford series plugins are legendary- but they are pretty new to me. There are so many great things out there and I discover them as I discover them! The reverb is something I’ve really been wanting to try out! Some Envolution presets are pretty remarkable- it’s definitely a lot more than a one trick pony. 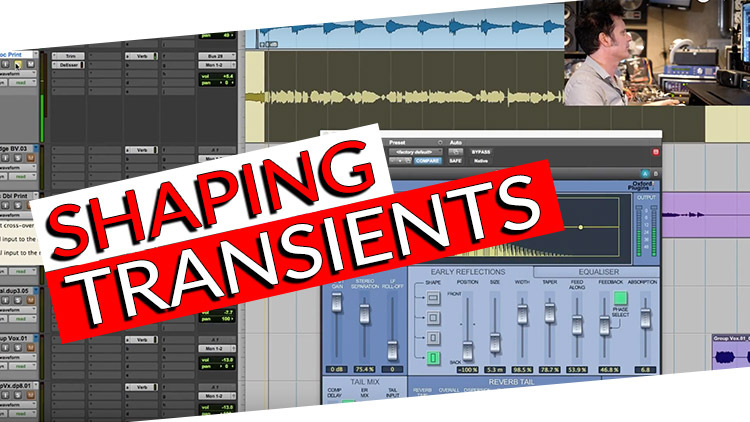 The Envolution has so much you can do to shape transients! It’s really really fantastic and it’s an incredibly useful tool. If you’re interested in learning more about the technical aspects of these plugins, you can read more under the video below or you can visit their website! I like the interface. I like the way they work. I like the Evolution. I feel like just the presets alone for the drum stuff is remarkably good. This plugin is also incredibly useful for solving problems like picking out transients and boosting things in a way that stops you from having to overly EQ. It has taken away a lot of the need to do a ton of EQ! Instead of that low end being too much I can start shortening things so that I’m not sitting in there high passing. It’s not always about applying EQ- It’s more about controlling the length of a note, and more importantly the attack. Once I start bringing the attack up I can turn it down so its little bit more pointed. Sometimes it is about simply shaping transients and shaping the sustain of a note so it doesn’t blur into 50 other different notes and create a lot of low end that takes you ages to figure out. For instance, if you’re doing fast kick drum patterns, I will use a transient shaper on a fast section to make it tighter. So instead of having a horrible low end rumble, each of those kick drums will get shortened so the low end doesn’t sustain as much. This is a big deal. It’s logical because now suddenly the notes are not overlapping. Two fast kicks where one is overlapping the other would be terrible it would be a 40-60 Hz rumble. So again shaping the transients is huge and the Envolution is great for that. The Reverb is the same thing! It’s simple so you can just reach in and pull down some EQ until it sounds really good. Make sure you enter the Giveaway above! Let us know what you do when it comes to shaping transients and when it comes to choosing reverbs! I’d like to thank our friends over at Sonnox for providing us with 3 copies of these plugins to give away to our amazing community! Designed with the highest technical and sonic performance in mind, the Oxford Reverb is a class-leading stereo reverb with hallmark Sonnox clarity and ease of use. The comprehensive yet intuitive GUI features flexible Early Reflection, Reverb Tail and 5-band Oxford EQ sections. The result is a sound that is natural and enveloping – with the effect sitting in rather than on a mix. To get you started, over 120 invaluable presets are included – from drier ambiences to open reverberant spaces and from sound effects to settings inspired by classic hardware. With so much control to hand it’s easy to design your own spaces too.